The partypoker.com World Grand Prix is a unique darts event in which the players have to hit a double both to start and finish legs, a rule that tends to favour the high-ranking stars who have what it takes to perform under pressure. There can be shocks in the first round of the partypoker.com World Grand Prix because it is only the best of three sets and every single one of the competitors knows how to throw arrows but, if the favourites get over the first hurdle, they are likely to go quite some way in the tournament. Conservative punters may elect to wait until after the end of the first round before placing their partypoker.com World Grand Prix bets and it is particularly astute if one wants to back Phil Taylor to win yet another major competition. The World Grand Prix is set up perfectly for Taylor because what separates The Power from the rest of the darts world is his ability to hit doubles. There are heavier scorers than Taylor – for example, Gary Anderson and Michael van Gerwen – but no-one comes to close to The Power when it comes to hitting the outer ring or bull of a darts board. 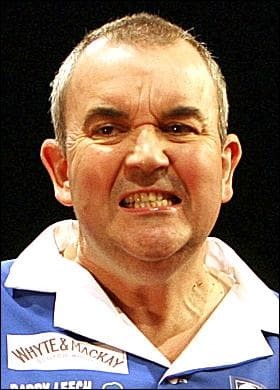 That is why Taylor’s match averages are so high – The Power does not waste many darts when he is finishing off legs. Taylor has won 10 of the 15 partypoker.com World Grand Prix events since the tournament debuted in 1998. However, it is worth noting that Taylor bowed out in the first round of the 2001, 2004 and 2007 editions and he did not make it past the second round in 2012. Taylor was a beaten semi-finalist in the only other year that he did not win the title, 2010. So instead of backing Taylor at odds of 3.00 with Bet365, to win the partypoker.com World Grand Prix again, wait until The Power has negotiated his first assignment, especially as he finds himself up against Jamie Caven. That is because Caven has the best checkout percentage across all major events played so far in 2013, albeit off a considerably smaller sample size than, say, third ranked Taylor, fourth ranked James Wade and fifth ranked Raymond van Barneveld. Many bookmakers are betting on the partypoker.com World Grand Prix semi-finalists that will emerge from the four quarters. There are some interesting odds in the quarters that do not include Taylor, particularly the quarter for which Van Gerwen is the 2.38 favourite with William Hill. Van Gerwen is the defending partypoker.com World Grand Prix champion but the format of the competition makes him open to shocks. No-one hit the treble 20 with greater frequency than Van Gerwen but the trebles for show, doubles for dough saying applies to the partypoker.com World Grand Prix more than it does any other darts tournament on the calendar. Van Barneveld is the best finisher in Van Gerwen’s quarter and he is available at odds of 6.50 with Sportingbet and Totesport to make the partypoker.com World Grand Prix semi-finals. Van Barneveld has the best competition record of the darts players that have not taken out the top prize. James Wade is the other partypoker.com World Grand Prix star worth backing to go well. Apart from Taylor, Wade is the only other multiple winner of the tournament having been successful in 2007 and 2010. Wade’s checkout percentage in 2013 major events of 42.97 per cent ranks him fourth and, if one goes back to the start of last year, The Machine is top of the pops on 42.78%, with Taylor next best on 42.09%. Wade is trading at odds of 3.75 with Boylesports to make the partypoker.com World Grand Prix semi-finals, with bookmakers favouring Simon Whitlock in that quarter of the draw. Wade is sixth on the PDC Order of Merit and the partypoker.com World Grand Prix is his favourite tournament, the one in which he has enjoyed the most success during his career. Some punters may be tempted to back Wade at odds of 17.00 with BetVictor, to win the partypoker.com World Grand Prix but The Machine is in the same half of the draw as Taylor. That means that he may have to beat Taylor to reach the final.